Provide comfort for the family of Earl Finholm with a meaningful gesture of sympathy. 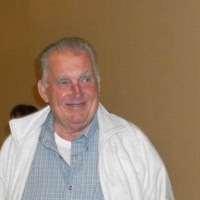 Earl (Poppy) passed away peacefully in his sleep Feb. 3rd at 86 years. He had a passion for sprint car racing and went to many races here and in the US. Driving truck was his life and he worked for many companies with the last LTL Contracting. He was predeceased by his wife Joan, father Werner, mother Annie, brother Max. Survived by sister Dolly, sister-in-law Martha Hazlett, 4 daughters Debra (Dan Schmidt), Renee(Calgary), Pat (Mike) Glena, Deanne (Doug Gordon), as well as 4 grandsons Dale Paddock, Kari and Steph Villa, Kyle and Megan Thompson (Calgary), Brandon and Emily Thompson as well as 4 great granddaughters, numerous nieces and nephews. Celebration of life & interment to follow at a warmer time. To plant a memorial tree in honor of Earl Werner Finholm, please visit our Heartfelt Sympathies Store. Debbie, Renee, Patricia and Deanna - my sincere sympathies on the passing of your Dad.